Maurice Watkins is a senior music education major at the University of Maryland, College Park. He is a student of Lee Hinkle. He has performed in both the University Symphony Orchestra and Wind Orchestra as well as the Percussion Ensemble. During his time at the University of Maryland, he has played several world premieres of contemporary compositions. 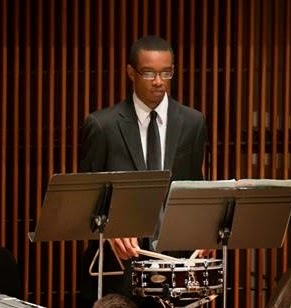 He has performed at the Maryland/Delaware Day of Percussion at various universities along the east coast. During high school, he was a member of the National Symphony Orchestra Youth Fellowship Program and has played with the National Symphony Orchestra Summer Music Institute for the last several years.